I learned how to fly starting in November of 2002. 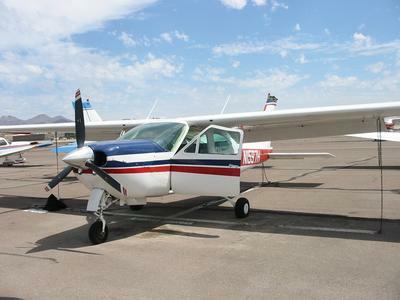 A year later, I bought a 1975 Cessna Cardinal RG, N1597H. A few months ago, after flying in my trusty machine for about 8 months and 200 flight hours (and with 350 hours total time), I started contemplating the trip that virtually every American pilot contemplates at some point: a coast-to-coast flight across the U.S. My family goes on vacation in a small town near Hague, in upstate New York, every summer. There's a small airstrip in nearby Ticonderoga, and I currently live in Santa Monica, CA, so it seemed like the perfect opportunity. We did it! My dad and I flew east from July 29-31, 2004. I returned on my own from August 11-13. I decided to put a diary of the trip on the web for several reasons. First, lots of people wanted to know how it went, and this is a better way to disseminate mass information than e-mail. Second, in the months leading up to my adventure, I desperately wanted to read about other folks' experiences so I'd know what to expect. There are surprisingly few of these kind of flights described on the web, so adding another one doesn't seem like a bad idea. Planning started 6 months beforehand with a simple question: Who can I take with me? The trip was a tough sell. My fantasy was to set aside a week or 10 days in each direction, stopping in random places to take in local color. I had a month off in between jobs so it was no problem, but no one else could take that much time off from work, or was interested in crossing the country in my little spam can. Finally I resigned myself to doing it alone, and shortened the plan to 3 days---short enough that my dad could take the time off to fly with me. And so the plan was hatched: he'd fly out from Washington, DC to Long Beach on JetBlue. I'd fly from my home base of Santa Monica to LGB, pick him up, and off we'd launch back to the east! The hardest question when planning a coast-to-coast trip is usually the same: how do we get over the Rockies? I was in a meeting in the Geology building one day, and on my way out, saw a map of the United States with terrain contours. After a few minutes I'd decided: we'd head due east and cross over Albuquerque. ABQ is off the south end of the mountain range, and avoids the highest parts of it. Once clear of the high terrain, we'd turn east-northeast and head for the Cleveland area, which is on the south shore of Lake Erie. Finally we'd turn further northeast and go directly to upstate New York, getting to Ticonderoga on the middle of the third day. I spent a long time picking out exactly which airports we'd stop at on the way. In my fantasy trip, we'd take off from Long Beach and get fuel in Winslow, AZ; head east until the Rockies ended, then ENE and spend the night in Liberal, KS; stop for fuel on the 2nd day in Quincy, IL; spend the second night in Youngstown, PA; and finally reach Ticonderoga, NY on the third day. I spent hours selecting those airports with a huge map of the U.S. on my floor, putting together flight plans for every one, and even picking Victor airways in between. What a waste of time. Don't bother remembering any of those cities because we didn't stop in any of them after Winslow. In the weeks leading up to the trip I spent a long time reading about thunderstorms, and watching the weather over New Mexico to understand the typical behavior. I also got my equipment in order: a 50-hour inspection on the plane and some avionics problems fixed. I bought $200 worth of charts: all the sectional charts, IFR enroute charts, and books of approach plates for our route of flight. My cousin Irv, also a pilot who had recently completed a cross-country trip of his own, lent me all sorts of cool stuff: a survival kit, a 6-gallon thermos for emergency water, a set of tiedown stakes and ropes, and an XM satellite radio for in-flight entertainment. The day before the trip was pretty busy. I was carefully watching the weather forecast. Arizona and New Mexico were unseasonably dry. Normally, the Monsoonal Flow makes for very active thunderstorms every afternoon over the high desert. But I was in for a treat; the forecaster at the National Weather Service could barely contain his surprise in his discussion of the weather that day: "that drying and warming trend we have been talking up later this week into the weekend still looks on track... A little surprised that MOS probability of precipitation aren't higher than they are given the surface front and northwest flow...but then again this is anything but a typical late July pattern and MOS output often has trouble latching onto such patterns." Wow, lucky me! I packed all my bags and weighed everything. My big suitcase for 2 weeks away, the survival kit and 8 gallons of emergency water, my laptop, the heavy box full of maps, and all the other random odds and ends added up to nearly 100 pounds. The day of the big trip finally arrived. I awakened early that day, said goodbye to Dana, and drove to the airport with my car full of stuff. The weather in Santa Monica was typical June Gloom (despite it being July): an overcast 1,000 feet above the ground that extended inland 3-4 miles. This layer appears over Santa Monica, and most of the coast, almost every morning for most of the summer. I spent an hour packing up the plane, parking my car, checking in with the mechanic one more time, and saying goodbye to everyone at the flight school with great fanfare. And then, hopped into my plane, fastened my seat belt, and---my approach plate for the ILS into Long Beach was nowhere to be found! The overcast layer required that I file an instrument flight plan for the short trip from Santa Monica, and you can't do it without the small sheet of paper that describes the procedure for landing at Long Beach on instruments. For some reason this one sheet was missing from my binder that has 1,000 similar sheets. The short flight to Long Beach was pretty easy. I took off at about 8:30AM, and by this time the marine layer was starting to break up anyway. I spent about 60 seconds in the clouds on the way up, but barely had any clouds on the way back down into LGB. I parked at "Million Air" and called my dad, whose JetBlue flight had landed a few minutes earlier. He took a short cab trip to Million Air ... and the trip team was complete! After refueling and packing my dad and his stuff into the plane, we were off! During this leg, my dad learned how to perform his job for this trip: management of all the charts. We had three types on board. The sectional charts are large, colorful charts that show terrain features, airports, and identify man-made landmarks on the ground. They're meant to be used in conjunction with looking out the window. 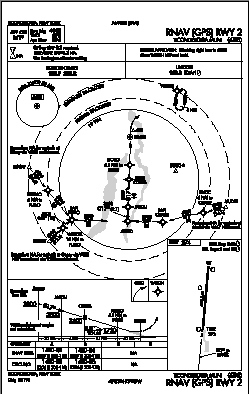 IFR enroute charts cover the same geographic area, but only have the information useful for navigation by instruments. These charts highlight radio navigation beacons and the published routes between points, but aren't cluttered with information about what you might see out the window. Finally, the approach plates are books full of sheets describing the detailed procedure for landing at an airport with no reference other than your instruments. Dad's job was to keep track of our current position, and have the appropriate sectional chart, IFR enroute chart, and approach plate book in hand. When he wasn't busy looking at charts, Dad also took some photos. An hour or so into the trip we crossed the Colorado River, which is hard to miss---a strip of lush, green, fertile land looking very out of place in an otherwise dead desert. 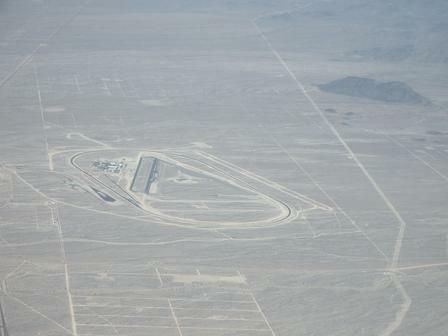 We also saw something that looked like a race track, but, strangely, it was in the middle of nowhere. According to the Phoenix sectional, it was the "Ford Motor Proving Ground". Maybe that's where they secretly test new cars, away from the prying eyes of competitors? At some point near Needles we also started to overfly an ordinary yet personally moving landmark: Interstate I-40. I am intimately familiar with I-40, because my dear friend Ben and I drove nearly its full length in 1998. Both of us were relocating from the East Coast to the West at the same time, so we took an epic cross-country road trip together. Seeing I-40 again was emotional for me. 6 years ago, I'd been on that very road down there, driving West... 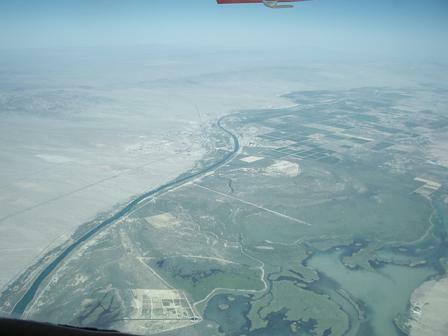 I would never have believed that in a few short years, I'd be on an epic cross-country trip back East, 2 miles above that same spot, in my own airplane! 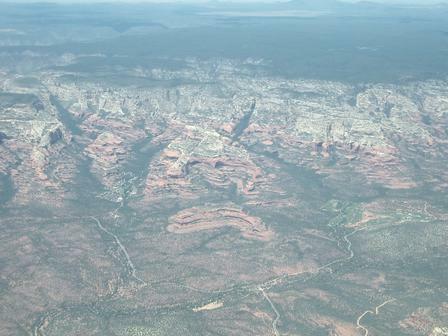 Soon we passed over Sedona, where the scenery changed from flat and colorless to breathtaking. Ben and I stopped in Sedona to go swimming during our 1998 road trip, but I don't think I ever fully appreciated how beautiful it was until I saw it from above. I didn't have much time to admire the scenery, though, as I was concerned about our landing in Winslow. I'd been watching the weather there daily and the wind seemed to really kick up every day at around 1:30PM, just like clockwork. The time now was almost exactly 1:30. Also, Winslow airport sits almost 5,000 feet above sea level. Since the temperature was 90 degrees, the "density altitude"---or, equivalent field elevation at a standard temperature---was reported at an alarming 8,100 feet! With such thin air, the performance of the engine is lousy since it is starved for air. Also, the plane is going much faster along the ground when it lands, since there's so little air to keep it aloft just before it stops flying. Luckily, we got there just in the nick of time; the wind was completely calm. 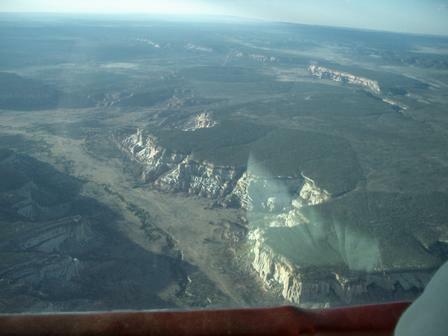 We lined up for one of Winslow's 7,000 foot runways and started our descent. The landing was stressful, but a "greaser"... one of those landings where you're not sure that the wheels are even on the ground. (I was not able to repeat this flawless performance for the remainder of the trip.) As expected, the plane kept on rolling and rolling for a few thousand feet before finally coming to a stop. Just before touchdown, the GPS was indicating our groundspeed at about 100 knots, or 115 MPH. We taxied back to the self-serve fuel pumps and refilled the half-empty tanks. Our original plan was to go from Winslow to Liberal, KS. A check of the weather computer in Winslow revealed that a few isolated afternoon thunderstorms were starting to develop east of ABQ, exactly covering our intended route from ABQ to Liberal. We waited in Winslow for about 3 hours, hoping the storms would pass. Looking back on that decision today (just two weeks later), I think it was "too" conservative. The storms were isolated; it would have been easy to take off and just deviate around them. But at the time, I wasn't confident enough to try it since I'd never done that before---especially near the Rockies, where the options for deviations are more limited due to high terrain. The route from Winslow to ABQ was clear of storms, though. At about 4pm, we decided to fly to ABQ and re-assess the situation. The plane lifted off without hesitation, but then climbed ever...so...slowly into the air. I was tense for the first 10 minutes as we inched into the air at about 75 feet per minute. Yikes! We watched a few houses pass below us, close enough that I felt like we could reach out and touch them. The plane seemed like it was being supported purely by willpower. 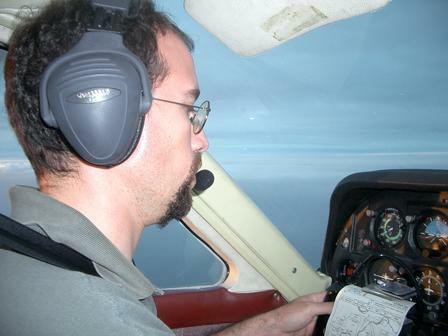 I kept my eyes glued firmly to the airspeed indicator, making sure that we maintained sufficient airspeed to keep flying, despite my overwhelming desire to yank back on the yoke and pull us higher into the air. We seemed so close to the ground, I delayed retracting the landing gear and flaps... and then, forgot about them! This was partly why our climb rate was so bad, until (luckily) Dad noticed the gear was down a couple of minutes after takeoff. Looking back, this was just bad planning: I should never have planned a route that required a full-fuel takeoff in the middle of a summer afternoon in the high desert. I should have accepted that we'd be stopping sooner for fuel, so that we could take off from Winslow with 3/4 or even 1/2-full tanks. "We're 150 pounds under gross, surely that must be light enough!" I'd thought. Well, the plane was light enough that we were safe, but heavy enough that I was sweating. Oh well--live and learn. There's an old saying in aviation: "The only time you can have too much fuel is if you're on fire." Well, apparently the real saying is, "...if you're on fire, or you're taking off on a hot summer afternoon from a high-altitude airport" but that was too long to fit on a bumper sticker. The trip to ABQ was short but very bumpy. Turbulence in a summer afternoon is standard in the high desert; everyone warned me about this, but I hadn't anticipated just how exhausting it was. By the time we got to ABQ, it was a very long 2 hours later, and I made the worst landing ever since I'd bought my airplane. This flight segment was by far the worst. Between the scary takeoff, the turbulent cruise, and horrendously embarrassing landing, I was ready to not be in the plane any more. I had a bad dream about an airplane that night and woke up wishing the trip were over. We'd plan a short segment so that we'd be able to take off without full fuel, lightening the load. Between the cooler air temperature (i.e., thicker air) and less fuel (i.e., lighter plane), the climb should be much easier. Of course, Dad was fine with waking up early, because he was still on East coast time and didn't want a repeat performance of Winslow any more than I did. We picked Dodge City, Kansas as our destination. My pilot friend Morten, who is also based at Santa Monica, had coincidentally been there the day before on his way back from OshKosh. He'd called to tell me it was a nice place to stop, and I also wanted to be able to say it was "time to get out of Dodge." Even the FAA has a sense of humor: the instrument approach has an EARPP intersection. We were at the airport by 7am, where I put only 10 more gallons of fuel in the plane. By my computations, we'd still have fuel to make it to Dodge with 90 minutes or even 2 hours to spare. I filed our IFR flight plan and by 7:40 we were holding in position at the end of ABQ's wonderfully long, 13,000 foot runway. I throttled up to full power and held the plane on the runway for as long as I possibly could -- we accelerated past Vr, Vr+5, Vr+10, Vr+15... by Vr+20 the plane was begging to be let into the air. I released the forward pressure I'd been holding on the yoke and we leapt up into the piercingly blue, crystal-clear sky. We climbed at 700fpm! That's almost ten times faster than our climb out of Winslow. In fact, it's not unreasonable performance even for a sea level takeoff, home in Santa Monica! My mood instantly changed. Ha, ha-- now I'm getting the hang of this! Our trip over the remainder of the Rockies was wonderfully uneventful. The early morning air was completely smooth; we sailed over the mountains at 11,000 feet as if we were being carried along on a cloud. I was in fine spirits, happy about the trip again, and really enjoying looking down at the fantastic scenery. In 2 hours time, the Rockies gave way to Kansas and the Great Plains. Minute by minute we could see the terrain dropping lower and lower under us. 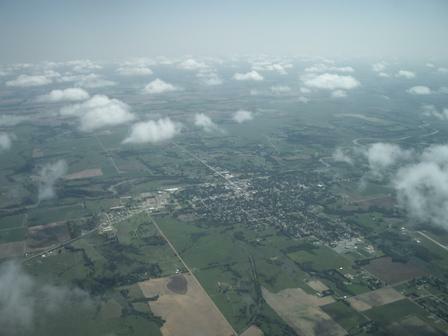 Before we knew it, it was time to land in Dodge City, after penetrating a tiny layer of scattered clouds. I brought us in for a nice landing, which was quite a relief after my terrible performance in Albuquerque. We taxied to the parking area, and I shut the plane down. But, oops, one more minor task--we had to cancel our IFR flight plan. In other words, we had tell Air Traffic Control that we were safely on the ground. If you don't do this, they send out a search and rescue party. I powered up the avionics, and on my #1 radio, started to announce, "Kansas City Center, Cardinal 1597H is on the ground in Dodge City, canceling IFR..." until there was a fizz and a pop and I realized my radio was completely dark. Wait. What? No radio? Please tell me this isn't happening. I turned everything off and back on again, hoping in vain that I'd flipped some switch the wrong way, but the sound of the "fizz.... pop" was all too distinct in my memory. The #1 radio was dead. My good radio! Arrrgggh! Dodge City may be a great place to go if you want to see a re-enacted gun fight, or get cheap fuel, but it's not a particularly good place to find someone who knows how to fix a KX-155. Now what??? Well, first things first: after contacting ATC using my other radio, we had some lunch. The fine folks at the Dodge City airport lent us the crew car. We had a nice Mexican meal in town, and stopped by the local auto parts store to buy a fuse and some screwdrivers. Back at the airport, I took my radio out of the panel and confirmed that the fuse was blown... but, replacing it just resulted in another blown fuse. Something was wrong. And the nearest avionics shop was 120 miles away in Wichita! But how do we get to Wichita with clouds in the sky and only one working radio? And a marginally crappy radio, at that? After some soul searching, I decided to try the flight. My GPS was still working, which had been my primary source of navigation anyway. The #2 radio hadn't given me any problems. It was old, but sturdy. I had a backup handheld radio in my flight bag. And, although there were some clouds, they weren't that thick, and were a few thousand feet above the ground. 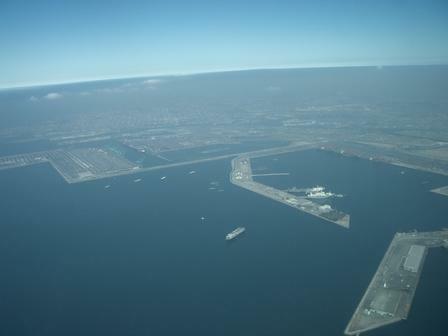 I was---again!---very nervous before the takeoff, but once we were in the air, I could tell the single-radio flight wouldn't be a problem. I was careful to write down all frequencies on a sheet of paper, instead of depending on my fancy but dead #1 radio to remember them for me. The clouds started to thin out, too. Our trip to Wichita had an unexpected benefit: my homesick Cardinal got a chance to see its birthplace! The Cessna factory is near Wichita, KS, and we passed right over it on the way. How exciting! We were down through the clouds long before we reached the airport, so did a visual approach that didn't even require the radio's navigation functions. After about 10 minutes of taxiing (Wichita is a big airport!) we arrived at the avionics shop that had been recommended by the folks in Dodge City. There, we found a kind gentleman who had about five lifetimes' worth of avionics experience piled on work-benches and bookshelves. At any moment it seemed his office would burst, covering everything within 100 yards with a strafing fire of half-assembled radios and stray transistors. Luckily, this disaster was averted, and in 45 minutes our radio was magically repaired and back in the plane! After the fixed radio, we were energized and still had a couple of hours of daylight left, so we decided to press on with a 3rd flight. Our first thought was to get to Indianapolis, IN, but a large weather front was between us and them, so we decided instead on St. Louis, MO. This was a wonderful flight. 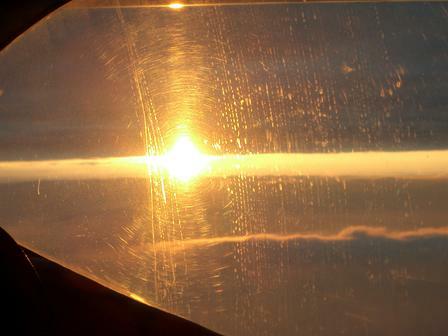 We were in the air by 6pm. Since we were finally in areas of much lower terrain, we could cruise along at 7,000 feet instead of the 11,000 we'd been using for the earlier segments. At this lower altitude the engine has all the air it needs to develop full power. 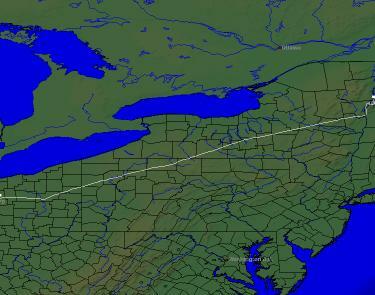 Plus, we had a nice tailwind, so the plane was scooting along at 165 knots (190 mph) most of the way. The sky was clear, our radio was working, our spirits were high---we felt unstoppable!! By the time we got closer to St. Louis we were rapidly closing in on the cold front ahead and the bad weather that went with it. The further east we went, the more the weather was expected to deteriorate. Our intended destination of St. Louis International was reporting low visibility and light rain. 20 miles closer to us (west of the international airport), the smaller Spirit of St. Louis Airport sounded much more promising---a comfortable 2,000' between the clouds and the ground, and no rain. We advised ATC we'd be diverting to SUS. Under control of ATC, we made our initial descent toward SUS, and soon found ourselves sandwiched in between two solid layers of clouds. Then, in one magical moment, the setting sun came down below the upper layer, and joined us in between -- turning the clouds above and below into a stunning orange. It was incredible; the photos don't do it justice. Just gorgeous! Finally, the sun set, leaving us in the dark (except for the 27 types of cockpit lighting I have). And then on to the further excitement for the flight: an instrument approach that kept us in actual clouds for about 30 minutes. 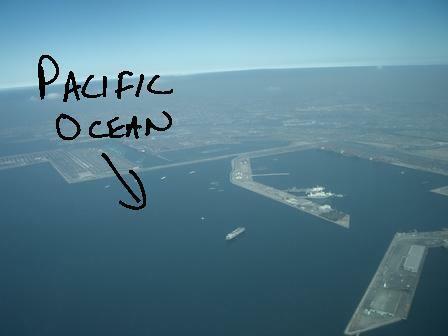 Many pilots do this routinely, but remember I'm from Southern California!. For us in SoCal, an "instrument approach" usually means spending 2 minutes in the marine layer just before you get to the airport. Spending 30 minutes tooling around in the soup was a new experience for me! We got vectored to the ILS. We had to take the "long way around," since SUS was landing to the west, and we were initially heading east. We had to go about 10 miles past the airport, do a slow turn back to the west and intercept the localizer. Finally, the time came for our final descent on the electronic glideslope, and we broke out of the clouds at about 1,900'. By this time, it was dark, and a fine mist further reduced visibility, so we continued on the instrument approach. At about a "2 mile final" (i.e., 2 miles from landing), we saw the beautiful strobe lights leading us right into the runway. And, to top off a wonderful flight, I made a gorgeous landing. Hooray! The next morning, the front that had been covering Indianapolis had made its slow progress to the east. We didn't want to go through it, for sure, so our game plan was to just wait as long as possible, then follow behind it. We got to the airport at around 9AM. There was a low overcast. I guess it would have been fine to take off through it, but every airport for the next 100 miles had a low ceiling (clouds at about 500 feet over the ground). If we needed to land in a hurry for some reason, or if my radio failed again, it would get a little "interesting." Dad didn't mind waiting, so we just spent some quality time on the incredibly comfy couches at Thunder Air in St. Louis. I periodically checked the weather on their computer. Finally, around 11AM, conditions had improved considerably. The St. Louis area was nearly clear, and airports along our route were reporting half-clear skies (much better than a low overcast!). The storm front had moved far enough East that we determined we could safely get all the way to Mansfield, Ohio. So, at about 11:30, away we launched into the scattered clouds. We were still west of St. Louis international, so we got vectored to the north for about 10 miles until we were clear of their airspace. Then, we were cleared direct to Mansfield, modulo some confusion with our flight plan. (I'm used to filing flight plans along airways; apparently, in the middle of the country, people usually just file GPS-direct to their destination without using airways. Every flight was a learning experience!) 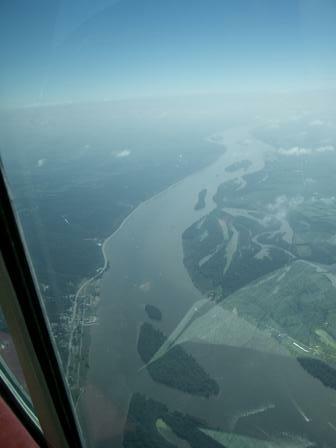 Dad snapped some pictures of the confluence of the Mississippi and Missouri rivers. The trip was more or less uneventful, except that the threat of thunderstorms was once again fairly real. A huge, ugly front was enveloping the east coast, and our planned landing was just to the west of it. As we cruised along we could see a long line of towering cumulus clouds way off to our right, reaching up to 45,000 feet and clearly visible from 100 miles away. They looked very imposing and I was happy not to be tangling with them. As we started our descent, we were in some patches of very bumpy cumulus for about 15 minutes. It was harder than our approach to St. Louis---in that approach, the stratus layer enveloped us completely, but stratus is typically pretty smooth. In this case we were popping in and out of clouds and often getting knocked around. This is typical of cumulus clouds, and what often kills non-instrument-rated pilots. We got a couple of hard bumps that popped us into a 30-degree-bank, and my inner ear was, at one time, begging me to turn further over rather than back to wings-level. Instrument training is, in part, learning how to ignore your inner ear and do what your artificial horizon says instead. A few minutes before landing, another plane on the approach reported going through an area of "heavy rain." A second pilot piped up, "We'd like to divert around that rain as well." Uh oh. I wish I had weather radar, instead of being stuck here, blind, in the clouds! "Uh, Mansfield Approach, Cardinal 97H, could you clue us in what all those guys are diverting around?" I queried the controller, hopefully. "They're all inbound from the east, 25 miles east of you," I was told. Whew! Mansfield, OH to Ticonderoga, NY!!! This flight was one of the most exciting! We had a nice lunch in Mansfield and refueled. Then, we tried to figure out what the heck to do. The storm front we were avoiding had moved further to the east, but it was still raining in our destination of Ticonderoga. But, hey, we weren't in any rush. So we took a nap in the pilot lounge, along with a gaggle of other pilots who were stuck there trying to get to various points on the East Coast. Two hours later we reassessed the situation. The front was curving off to the north-east, following the contour of the coast. The trip from Mansfield to Ticonderoga takes us pretty far north, though (see map at top). It seemed like we might be able to sneak in behind the front. Syracuse, NY, was about halfway to Ticonderoga, and seemed like a very safe alternative... at worst, we could just land and spend the night in Syracuse, and complete the last hour of flying the next day. 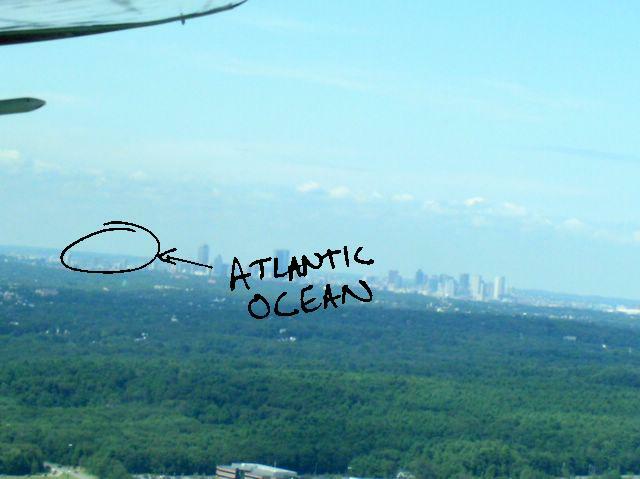 I decided to call the Flight Service Station and see what the professional aviation meteorologists had to say about it. "I'm in Mansfield and am trying to get to Ticonderoga, or at least as far as Syracuse if I can. What do you think?" "It should be possible," the briefer told me, "to get at least as far as Syracuse. But there's a second system coming in off Lake Erie, so you should stay south of Akron." He even gave me a series of waypoints to fly that would keep us out of the weather. Wow, now that's good service! "Just call us again over Elmira to see how the weather is developing," he suggested. What a plan! Dad and I launched again, with the briefer's suggested route programmed into the GPS. It was bumpy in the clouds so we climbed up to 9,000' to get above the tops. For about an hour, the flight was wonderful, as a strong tailwind from the cold front propelled us at about 172 knots (198mph). The image to the right is our actual ground track, as recorded by ATC radar (courtesy of FBOweb.com). 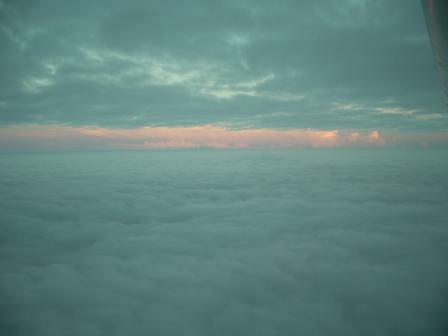 Even at 9,000, we were eventually enveloped in clouds again, and as the sun gradually set, we lost visibility completely. We continued, solely on instruments. Around Elmira, I tried to raise Flight Service, but several of the frequencies were closed. After 10 minutes of trying, we couldn't get the weather. Uh oh -- Strike One. (Well, let's call this Strike Two. Strike One was the fact that we had storm fronts around.) I started to get nervous since it was now too dark to see the storms. How close were they? Then, Strike Three -- my primary cockpit lighting failed. My instruments are normally illuminated by tiny red lights mounted all over the panel. This system failed somewhere after St. Louis. Yikes. Of course, I have 6 flashlights in my flight bag, an overhead dome light, and a yoke-mounted light, so this wasn't an emergency. But it was another strike on the list of reasons to abort the flight. Finally, Strike Four -- "Cardinal 97H, verify that you're still at 9,000 feet, I'm not reading your Mode C." Oh, crap. Mode C is a feature that lets controllers see my plane's altitude. This is important for various reasons, but top on the list that evening was that the controller can warn me if I'm accidentally using an altitude that's too low. I reset the transponder several times with no effect. As the strikes accumulated, I got more and more uncomfortable about continuing the flight. I started to look at the chart to decide where we could land. I wanted to be on the ground, no matter where we were! I had just opened my mouth to say to Dad, "Let's just land and finish this tomorrow", when, like magic, the strikes started to unwind themselves one by one. First, "Cardinal 97H, contact New York Center now, and ask them about your Mode C -- the problem might be on our end." On your end?? Why didn't you tell me that 10 minutes ago?? 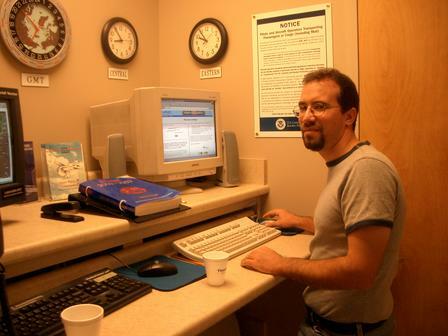 "New York Center, Cardinal 1597H with you level 9,000 direct Ticonderoga, can you verify you have our Mode C?" "Uh, yeah, sure, I've got it loud and clear", this new controller said, in a tone as if I'd asked him if he knew the year was 2004. The controller also helpfully provided us with a local frequency to get weather information, and we were able to contact Flight Service again. They confirmed that the path to Ticonderoga was clear! In fact, the second front was now moving in to Syracuse, so Ticonderoga looked like safer bet than our "backup" plan. He suggested a slight further deviation to the east to keep us out of the weather. My Mom, who was tracking our whole trip on the computer, later told us that we'd been depicted as driving exactly through the center of two parallel storm fronts. Score one for the Flight Service Station! Using my yoke light and some new batteries, the cockpit lighting situation was also looking much better -- I had a fine view of the instruments. And -- "New York, Cardinal 97H, I hate to sound paranoid, but can you please verify one more time that you see our Mode C?" "Yep, I sure can," he said, sounding confident. And, just to top it all off, we were out of the clouds again! We could now clearly see lights on the ground. Hooray! This will work after all! My blood pressure returned to normal. We flew on, breathlessly. Dad and I couldn't believe we were so close to our goal. In another 20 minutes we were close enough to hear the weather being broadcast from Glens Falls -- a good-sized municipal airport very close to our final destination. They were reporting clear skies! By this time, we were talking to Albany Approach. After we checked in, the frequency was completely silent. It was 10PM on a Friday night; is this normal? "Albany Approach, Cardinal 97H... radio check?" "Cardinal 97H loud and clear." "Great, we were just worried that we hadn't heard anything for a while." "Yeah, it's just that time of the night." 20 minutes out from Ticonderoga, Albany Approach handed us off to Boston Center -- the agency that covers Lake George. The Boston controller asked us to "say approach request." She wanted to know: did we want a visual approach, or one by reference to instruments? Well, technically, a visual approach would have been legal. We were in the clear; only a single layer of clouds high above us. But a visual approach would have been a bad idea -- I discovered that in the middle of upstate New York at night, when the moon is obscured by clouds, it is very, very dark. We could see an occasional light on the ground and nothing else. No horizon. No terrain. No ground features. No nothing! "We'd like vectors to the GPS approach to runway 2," I replied. "Uh, Cardinal 97H, I'm not, uh, familiar with that approach..." she trailed off, with the sound of papers rustling in the background. "Where do you want to be vectored? I can get you as low as 4,200." Ha, ha. Usually the controller knows the approach better than the pilot. Now she was asking me what she should do with us! "Can you take us to PULLO intersection?" I asked. I had the approach plate for Ticonderoga in front of me already, of course; PULLO was the name of the spot that starts the instrument approach. "Roger, Cardinal 97H, proceed direct to... that intersection," she said. And off to PULLO we went. We passed over Glens Falls airport. Perfectly clear and well lit, it would be an easy landing. The thought crossed my mind -- why not quit while we're ahead and just land here, right now? Well, we'll come back if there's any problem. Let's try Ticonderoga first. Down, down into the inky blackness over AFRED intersection we descended, and further down near JADSU... just following the approach, like I was trained, trying to ignore the incredible excitement that was welling up inside of me, trying to ignore the fact that I was enveloped in total darkness making mountains invisible and with potential storms in the distance, trying to ignore the flash of light I'd seen that might have been lightning 100 miles away or maybe just a camera, trying to forget what it would feel like to land triumphantly, no, just trying to forget all that and focus on doing this damned approach correctly, getting the needle centered, trying to push everything out of my mind but that mantra "fly the plane, fly the plane, fly the plane...."
At some point, I looked up out the windshield at the black nothingness. It was like being locked in a closet. Totally featureless. Wait, except--- is that a green light I just saw? Airport beacons are white and green. Could it be? I clicked my microphone-key 5 times. In theory, this should turn on the runway lights. BAM! The most beautiful, perfect, gorgeous, lovely, fantastic runway in the history of aviation suddenly appeared in my windshield. It was a tiny line of bright white lights about 10 miles away. "Oh my God, oh my God!" I started to shout. "I see the runway, there it is, there it is, there it is!!!" My dad was beside himself. I had asked him 5 times in the last 10 minutes not to talk or distract me in any way, as this was a critical phase of flight. Now, I was afraid that he was going to burst right out of his seatbelt with pent up excitement. But, no, fly the plane, fly the plane, fly the plane.... in the long moments I'd spent looking out the window at the far-away runway, we'd drifted 30 degrees off course. "Dammit, stop looking outside, this isn't over, just fly the plane, get that needle centered..."
We proceeded on the approach, descending until we reached the minimum altitude for circling around. I wanted to land straight ahead, to the north, but my GPS was telling me that our groundspeed was 115 knots while my indicated airspeed was only 90 knots. Too fast, way too fast, clearly the wind was still at our backs! So, we went right past the runway, another mile north, then turned back to the south, still unable to see anything but the runway lights. I turned on all my landing lights, extended the flaps, and down we went again, aiming for that beautifully lit runway. 1,000' ... 900' ... GUMPS OK, before-landing checklist complete. 500' ... 400' ... Flaps 30. GPS groundspeed is down to 65 knots. Perfect. Check again that the gear is down. Green light is on. Runway lights set to maximum. 300' ... 200' ... everything seems right. I see no reason not to land. 50 feet. 30 feet. 10 feet. 5 feet. It's hard to describe this moment. It's emotional even writing it down, 2 weeks later. It was sort of like the end of Apollo 13, when the ship finally splashes down in the ocean. While we were still rolling out, I started to hyperventilate. I couldn't believe that we were actually on the ground in Ticonderoga. This whole experience had seemed larger-than-life, and I had fantasized about landing at this airport for so long... it was almost incomprehensible that we were actually there. I didn't use the brakes, but instead added a little power and let the plane roll to a gentle stop at the south end of the 4,000' runway, where the tiny tie-down area and my jubilant family awaited. They waved at us; I flashed my landing light back, pulled into a parking space, and shut the plane down. I opened the door. In an instant, while I was still wearing my seat belt, my Mom was at my side. We had a tearful reunion. Not bored yet? On to PAGE 2, the next week of flying; PAGE 3, the voyage home, or my Tips for Pilots planning similar trips.